The premium quality fresh mangoes being our specialty! The city of MULTAN-PAKISTAN is well known as the land of Saints, Cotton and MANGOES. The mangoes from Multan are well known all over the world for its quality traits due to its geographical positioning. The organization is a group of progressive growers having vast experience for more than 50 years has been in the business of production. Now entering in the international market and certification schemes for the production, proccessing and export of premium quality horticultural commodities to Europe, Middle East, Gulf and Far East ensuring the safe production practices (for human & environment). 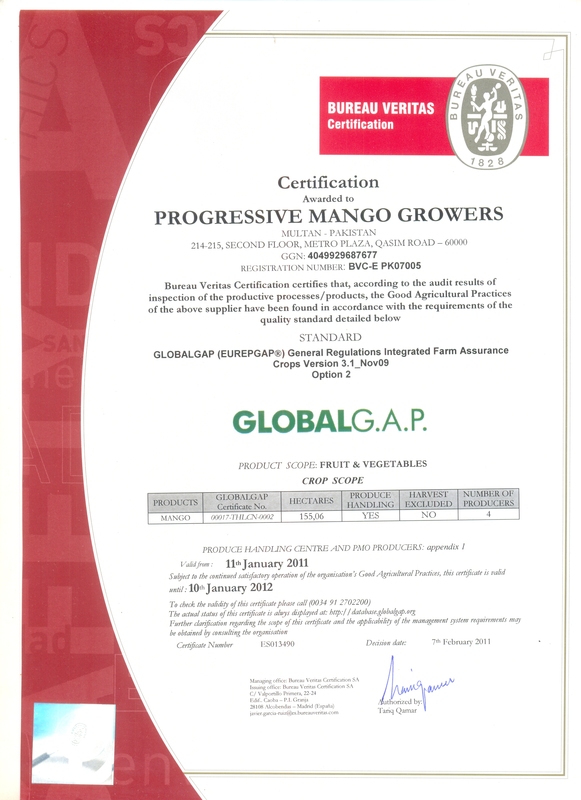 Progressive Mango Growers(Group) have GlobalGAP certified Farms from where are produce is making a break through in the International market, being a pre-eminent trader, exporter & supplier of fresh premium quality fruits. We have a large network of growers from which we collect our fruits process, pack & then store them in a cool and hygienic place. We mainly deal in farm fresh fruits & vegetables, the premium quality fresh mangoes being our specialty. We are one of the emerging fresh fruits exporters in Pakistan. Since we export our products and seeking the export standards of Pakistan, our officers specially check our fruits and vegetables before supply. With our vast experience of regional and seasonal climatic variations, we are well qualified to select top quality fruits from each area in accordance with the international requirements. The agricultural and market specialists working with us during the optimal picking time and packing requirements of our client’s countries. Our commitment and responsibility to produce the freshest quality while reducing our environment foot print continues to meet the stewardship values established by our company.